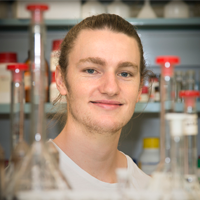 Tom McCoy studied a Bachelor of Science at Monash from 2011-2013, with majors in Chemistry and Physiology, after which he went on to study an Honours year in the School of Chemistry under the supervision of Dr Rico Tabor. He is now studying a PhD in Chemistry with Dr Tabor. "As part of my major, I chose to carry out an undergraduate research project unit looking at the fundamental properties of graphene oxide-stabilised emulsions which resulted in my first publication featured in the Journal of Physical Chemistry C. Because of this fantastic result, I was invited to attend the 2014 ACIS student conference where I presented the work from this paper in the form of a 15 minute oral presentation. Such an outcome would have not been possible without the incredible supervision and support from my supervisor, Rico. 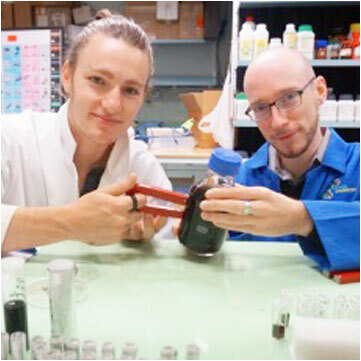 Naturally, I chose him as my Honours supervisor where I continued investigating graphene oxide, this time looking at magnetic recovery of the material for water purification. This resulted in my second publication, this time in the journal ACS Applied Materials and Interfaces. The work from this publication has received significant media attention, with a major article in The Australian newspaper and a radio interview on 3RRR's science show, Einstein A Go-Go." Tom is now studying a PhD under Rico's supervision, which is focused on the carbon-based material, graphene oxide, which has attracted an enormous amount of research interest in recent years owing to its potential for a wide variety of applications. His project explores the fundamental chemistry of graphene oxide systems in order to explain and predict their behaviour so that the material can be implemented more effectively to real-world problems such as water hygiene. "Monash helped me to achieve success by inspiring me to aim high. The academic staff invest huge amounts of effort into making the coursework interesting, challenging and enjoyable. When I started my Bachelor of Science, I had no special interest in chemistry and would never have imagined myself pursuing a career in the field. However I found the quality of teaching and friendly, approachable nature of the Chemistry staff second to none. They shared their passion with me, inspiring me to continue with the subject and complete a major. As an undergraduate, the Faculty of Science prepared me brilliantly for my subsequent postgraduate studies; my ability to work diligently, to write and communicate effectively, think critically and solve problems has developed significantly since I first started my university studies." Pictured: Tom McCoy (left) with supervisor Dr Rico Tabor (right).